Members are welcome and indeed encouraged to bring their own projects to work on at The Shed and as well, are invited to participate in small community projects such as building useful items for local charities, pre-schools, primary schools, kindergartens, hospitals and retirement centres, etc. As well, The Shed is happy to make 'one-off' special items for disadvantaged members of the local community. 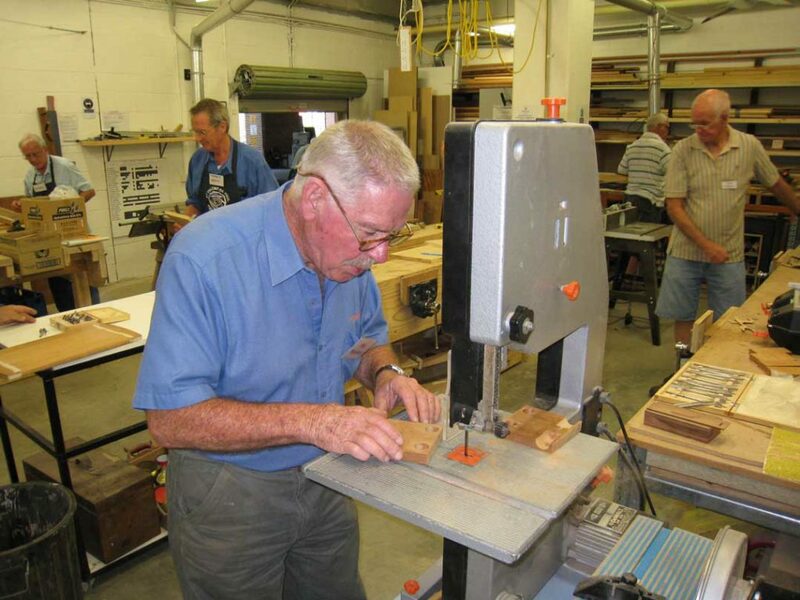 All Men's Shed activities are conducted on the premises. Projects that members may wish to undertake are limited only by their imaginations although, due to space limitations, excessively large projects cannot be accommodated. Members have made rocking horses, billy carts, tables, stools, bread & cheese boards, BBQ trolleys, mail boxes, doll's houses, wooden trains and many other toys. Some members have turned out beautiful timber pieces on lathes, while others have crafted jewel boxes, statuettes, and chess sets. The list is endless. The one thing that members would appear to share in common, is their enjoyment of doing things in the company of other men. As a means of raising funds for raw materials and workshop consumables, members are encouraged to make items that can be sold at community markets, fairs, shopping malls, etc. The sale of such items is undertaken in collaboration with the local Lions and Rotary clubs. The Shed is supervised at all times by suitably qualified personnel, and there is no requirement for members to have any previous experience in using the tools or equipment. Appropriate work safety practices are enforced, and tuition on the use of all equipment is provided as needed. Visitors are always welcome.... no appointment or prior booking is required, simply call in and meet the members, share a cuppa and a yarn.